One of summer highlights in the Duluth-Superior Twin Ports area is the annual Lake Superior Dragon Boat Race & Festival the last weekend in August. In 2007 the festival attracted 86 race teams and over 1900 competitors from the United States and Canada. In 2011, 92 teams were signed up to compete; in 2014, 88 race teams competed. The Lake Superior event is one of the largest Dragonboat races in North America. Dragon Boats are huge canoes with a crew of 22. Befitting its name, the bow of the canoe is decorated with a Dragon masthead. Dragon Boat Race rules require that every team must have at least 8 women members among its 20 paddlers. Rounding out the crew of the boat is 1 drummer and 1 steersperson. 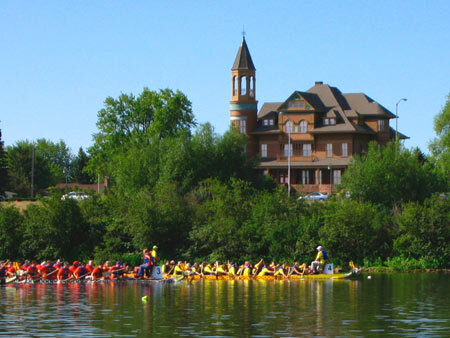 Similar Dragon Boat Festivals are also held in Thunder Bay, Ontario, Sault Ste. Marie, Ontario, and Grand Marais, Minnesota. The Lake Superior race is held in a protected part of Superior Bay on the south side of Barkers Island. 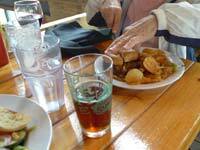 The island is host to all the other activities associated with the festival and the team campsites. Sponsored by Superior Rotary Club and Duluth's Harbortown Rotary Club, the Festival opens on Friday with a team parade, opening ceremonies, the food & beer tents, and entertainment on the festival stage. The race itself starts bright and early on Saturday morning at 8:00 am. With 86 - 96 teams competing and 46 - 50 race heats, they have to get going early to finish before dark! Several other activities run concurrent with the race heats. The Superior Optimist Club hosts a pancake breakfast from 7 am to 11 am. Various entertainment is on the main stage from the morning to late afternoon. Entertainment continues into the evening at the Barkers Island Inn Festival Tent. The Kiwanis Club hosts special activities for kids. Naturally the food and beverage tents are in full swing. Nearby parking is free and there are free shuttle buses to and from more distant parking at the Mariners Mall. < < < Having fun definitely is part of the motivation of many teams. I think these "Bee Ladies and Gentlemen" were the "YellowJacket" Team from UW Superior. < < < One of my favorite teams was "Smoke on the Water" led in the parade by their bagpipe man - who brought his pipes in the boat too! < < < The opening ceremony included raising both the Canadian and American Flags plus each country's national anthem. Terrific entertainment by "Misora Taiko" . . . a Japanese Drum ensemble. Every foot in the place was taping to the rhythm as the drums thundered across the landscape. < < < The "Stone Dragons" team (#1) and the "Better Dragons" team (#4 lane) were a photo finish in their heat. They also went head to head in the Finals, finishing first and second. The Stone Dragons of the Duluth Boat Club were the grand champions. < < < The "Quetico-Superior Dragons" get ready to pass the reviewing stand after winning their second heat race. It was a beautiful day for a race. A few clouds to keep it from getting too hot. Only a light breeze on the water. Some members of the Arashi Team warm up before the Championship race. Guess it paid off. They won by a fraction of a second, in a photo finish, over WikiWiki Wahine. < < < Lane 4, Arashi, was the photofinish winner over Lane 3, WikiWiki Wahine in the overall Gold Division Championship. Close behind were A Better Dragon in Lane 1 and Legends in Lane 2. The race timing system involves a high definition video recording system that records 1500 frames per second. < < < Lane 3, Women on Fire, was the winner of the women's division over Lane 2, Doggie Paddlers, and Lane 1 Invicible Dragon-Women. WikiWiki Wahine did not compete because they were in the overall Gold Division Championship. WikiWiki Wahine, second place overall, is the US National Women's Champion and will be representing the US in the 2012 World Dragon Boat Championship in Hong Kong. Sponsorhips & Fundraising Info Here. WikiWiki Wahine competed again in 2014 with a co-ed team, 12 women and 8 men paddlers. They won their first round elimination heat (see video) but again came in second place in the championship race. 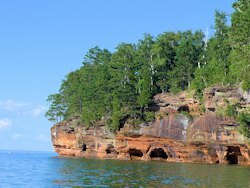 See more things to See and Do in Superior, Wisconsin. 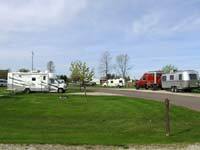 The campground and park offers Wisconsin's highest waterfall, a nature center, 9 miles of hiking trails, 59 campsites, RV (18 electric hookups & dump station) and tent camping (showers and flush toilets in summer). 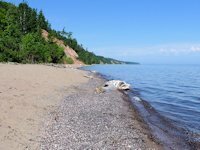 Located a few miles east of the city of Superior, Amnicon park has attractive waterfalls, scenic hiking trails, a picnic area, and camping. Camp sites mostly rustic, but well spaced and laid out. 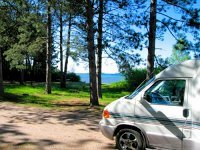 Great for tent camping and suitable for smaller RVs (but there are no utilities). Rustic tent camping, canoe camping, trout fishing.